I never thought I'd write a post like this. Being a meat eater and someone who has always had a soft spot for bacon, the idea of eating a Vegan brunch was beyond me. 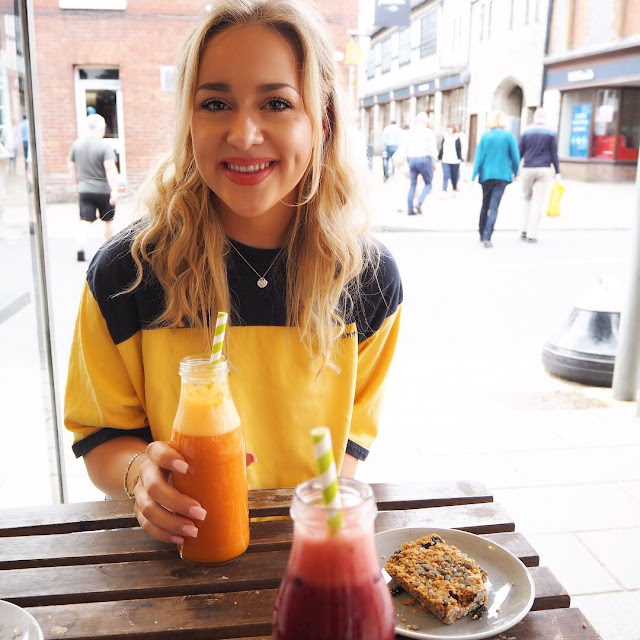 However, there was once a time I went Vegetarian (I did it for the wrong reasons and that is a whole different blog post altogether...) for a year and found it not actually that bad and brands such as Quorn and Linda McCartney made it so easy. My meat eater heart was put at bay for a period of time. With that being said, I inevitably went back to eating meat but that doesn't mean I'm opposed to trying Vegan dishes and I'm so glad I did. A couple of weeks a go I went to visit my best friend G in Winchester. I've never been to Winchester before, even though I kept telling myself I would go the entire 3 years at university, but a las I was poor and couldn't afford it. 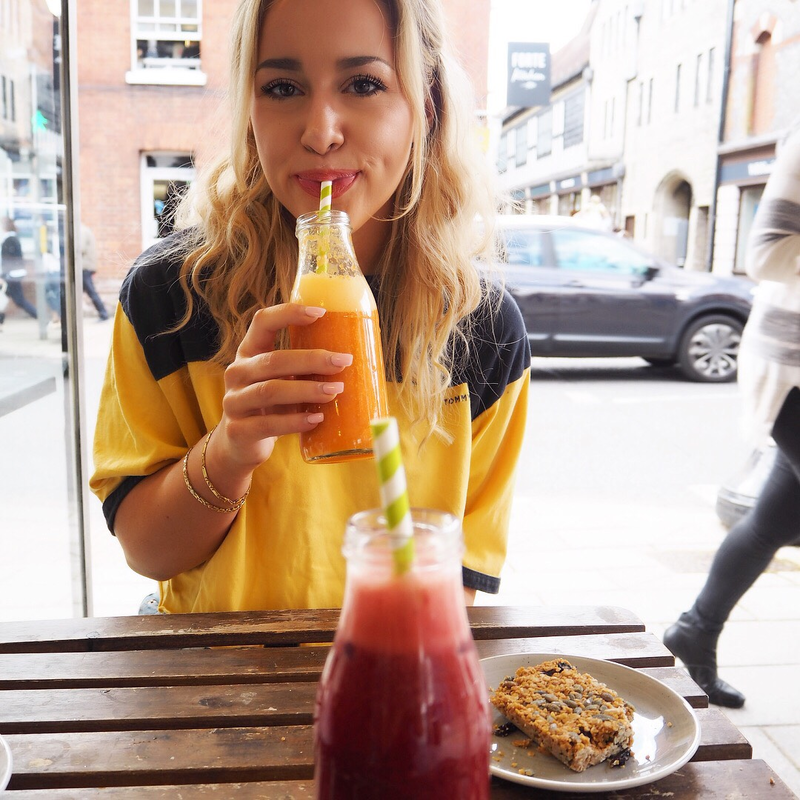 We ended up finding this little cafe/breakfast bar called Rawberry (check it out here!) at first I thought it was just a regular juice bar that did healthy snacks and sandwiches. We soon came to realise it was 100% Vegan friendly and drop dead delicious. We spent a good 5-10 minutes deciding what to have (okay, I took a solid 5-10 minutes...indecisiveness at it's finest.) the menu wasn't extensive but it was all so tempting and unique that I really couldn't pick what I would like. The mixture of different ingredients, things I've never tried before or thought would even go well, absolutely baffled me. Like I said, being a meat eater I would always go for something that had meat in it - end of story. In the end I came to the conclusion "what is something I absolutely love to eat that is meat free?" CHEESE. Now, this is where I was a bit stumped - cheese is obviously not Vegan however on the menu they had this gorgeous Halloumi bagel that was staring me in the eye begging to be eaten. This bagel was simply called "Halloumi" and consisted of spinach, beetroot hummus and well duh, halloumi. They offered me the option to have it toasted or not and I obviously went for toasted. I believe the price of the bagel was around £3/4. There is no point going to a juice bar if you don't get a fresh juice or smoothie you know? There was a wide variety of juices and smoothies all packed full of healthy ingredients with adorable names to indicate exactly what each juice benefits for your body. G went for something that I knew she would go for in a heartbeat. If you know G like I do you would know she is all about skincare and making sure she treats her skin right! 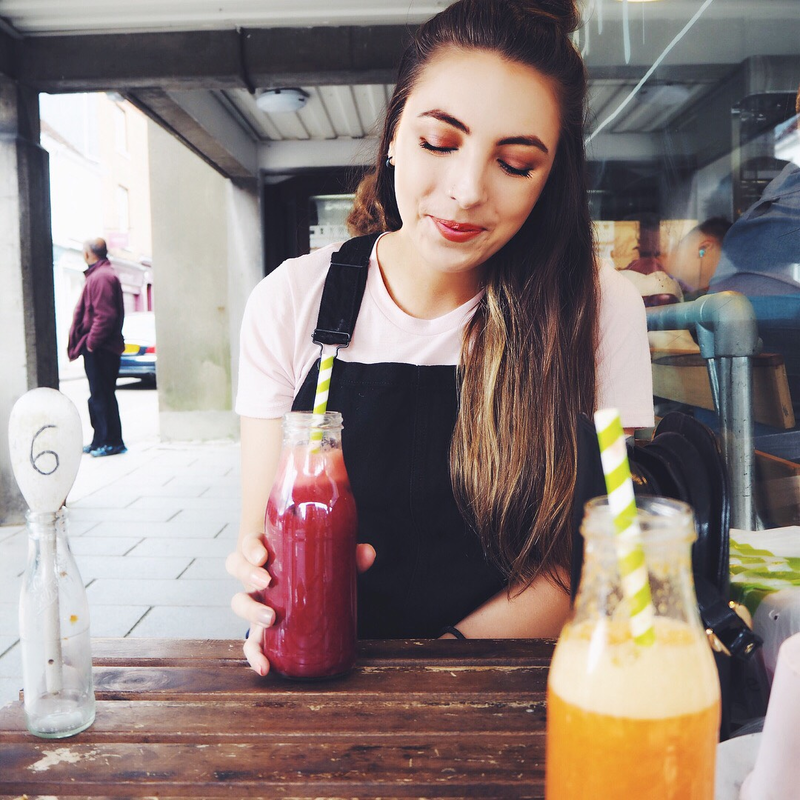 The "Beauty Brew" smoothie (large for £4.75) contains all those lovely ingredients to make your face glow: strawberries, carrot, mango, orange and coconut water. I went for something somewhat similar but not quite the "Rawberry" this contained a whole bunch of mixed berries, beetroot, carrot and coconut milk. 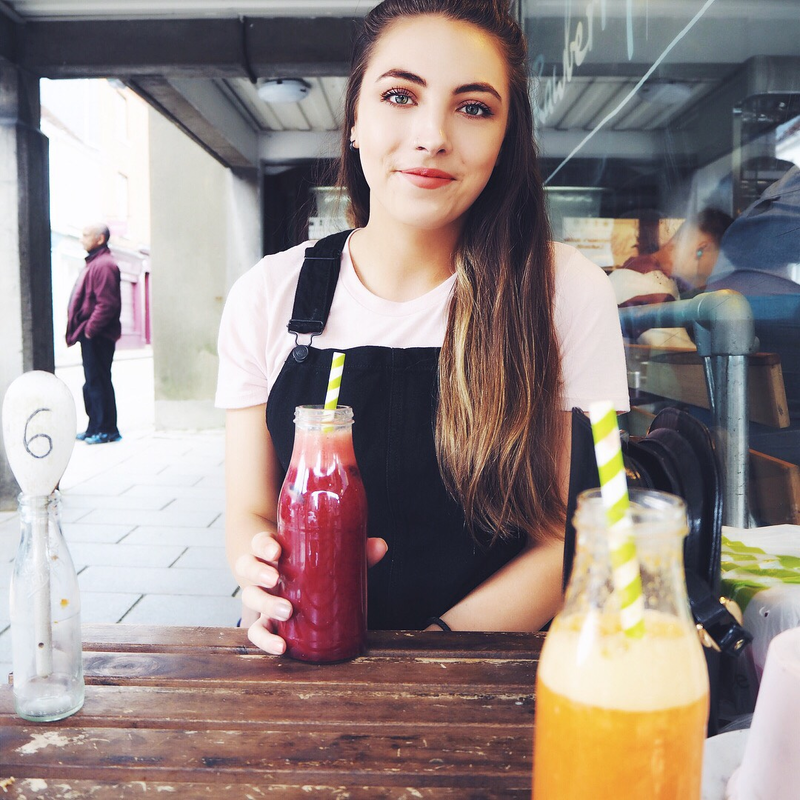 If you're ever in Winchester or spot a Rawberry juice bar, I urge you to check it out. It's not the cheapest of places but I can justify spending a little bit more on something that will fuel my body with all the essentials. Rawberry has completely changed my outlook on Veganism. I never had anything bad to say about Vegans (other than the overly radical, shove Veganism down your throat, kinds of people...don't do that, that's not cool) but I never ever tried anything Vegan before. This was a delicious alternative to my usual brunch and I would 100% recommend going back for another! 6 comments on "♡ VEGAN BRUNCH: RAWBERRY ♡"
Thank you, it's honestly such a delicious place! The smoothies were so refreshing! 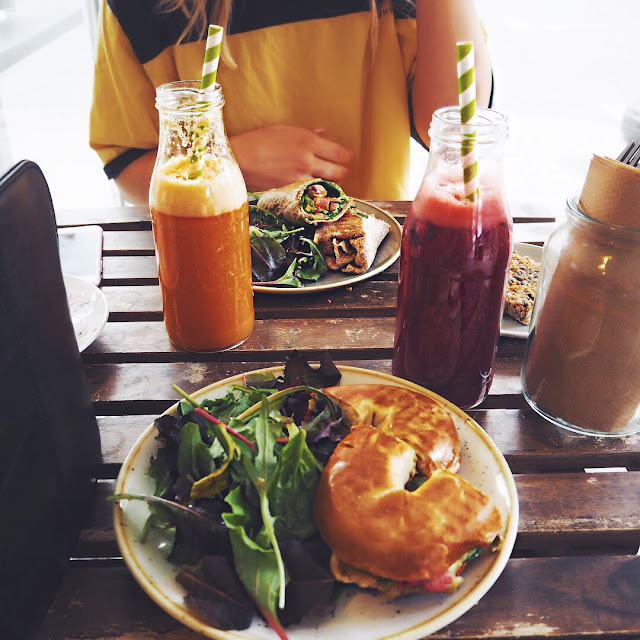 The breakfast sounds so yummy, and the smoothie looks so refreshing! Those juices sound and look delicious! I'm a meat eater too and never really order anything meat free, I'm going to give it a go sometimes!